Jewish businessmen purchase Tel Aviv apartments for Eritrean infiltrators. Two Jewish businessmen purchased apartments for illegal African infiltrators near the home of Supreme Court Chief Justice Esther Hayut, Channel 20 reported. The New York businessmen bought two apartments, the Bereishit Movement's Yehoshua Hame'iri told Channel 20. "The idea is to house Eritreans, who will work in gardening," Hame'iri said, noting that the idea came from an interview with Tel Aviv's right-wing activist May Golan. "Currently, the number of people stands at 15." He also added that the pair were planning to purchase a third apartment. Earlier this month, the Jerusalem Appeals Court dealing with issues of status and residency in Israel, recommended the State deport Eritrean asylum seekers back to their country "regardless of their political position as supporters or opponents of the regime." 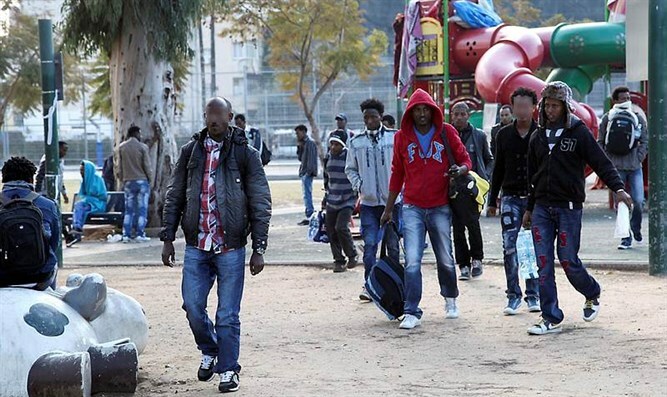 Activists backing deportation say Sudanese and Eritrean infiltrators, most of whom live in southern Tel Aviv, have caused the local crime rate to skyrocket, endangering Israeli citizens. A January poll showed that most Israelis support deporting the infiltrators.